I’ve never read a book quite like The Weather Fifteen Years Ago by Wolf Haas. It doesn’t proceed in any typical sort of narrative, but instead is simply a conversation between an author and a book reviewer. That’s it. Back and forth, chatting. Sometimes trivial, sometimes bitter, but always, back and forth. It should be boring as hell, but it’s wonderful. When I first began the book, I wasn’t sure I could tolerate the style. Then I became hooked, on both the underlying story and the snarky conversation of the two. Over the course of several days, the reviewer and author meet and discuss different elements of the story. The reviewer questions the use of certain words and phrases, asks why characters behave as they do, and generally tries to get the author to admit to certain prejudices in the story (regarding women, national culture, etc). The author, for his part, gives new meaning to the term “unreliable narrator”, because you never really know if it’s the author Haas or a character created by Haas who is beguilingly called Hass (who happens to be an author). It’s really not as confusing as it sounds! The book they discuss is the account of a man who is obsessed with the weather at the resort he stayed in as a child, where all kinds of influential events took place. Even as he seems to forget the place, the habit remains: he finds out the weather and keeps track. The story is told backwards, and characters are introduced randomly that fill out the plot and keep it lively. Yet, it has to be remembered…as interesting as their conversation is, there is no book for you to pick up to read. The interview is the book. It’s an entirely different way of reading, because every detail has to be discerned by direct (or offhand) comments by the speakers. It’s almost like eavesdropping on a juicy story. 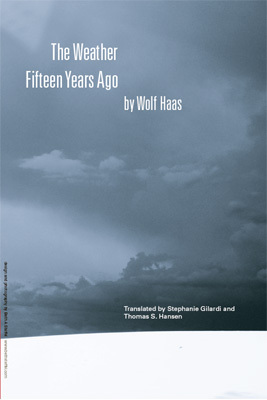 The reviewer tries to draw out intentions from Haas that may or may not exist, and provokes him a bit as she tries to uncover sentiments that she senses are there. Thus they discuss the ways people interpret and misconstrue plot and character elements. Essentially, this is two stories in one: the interview, and the plot of the book that you’ll never get to read. When you finish, you actually feel bummed out that you can’t go and order it immediately. Special thanks to Ariadne Press for the Review Copy. This sounds like a unique and fascinating book. Had I not read this review of yours, my concern if i picked up the book would be that I'd get bored with it or dislike the way it's written. Your review assures me that this won't be the case. I am captivated by the idea of reading what the author of the book tells the reviewer about writing and creating characters and so much more. Thank you for your terrific review, Amy, and for highlighting this book!